HUONE’s creative and inspirational meeting rooms are the perfect venue for all offsite meetings and corporate events. Located along the iconic Singapore River, HUONE Clarke Quay is just 5 minutes outside of the Central Business District. 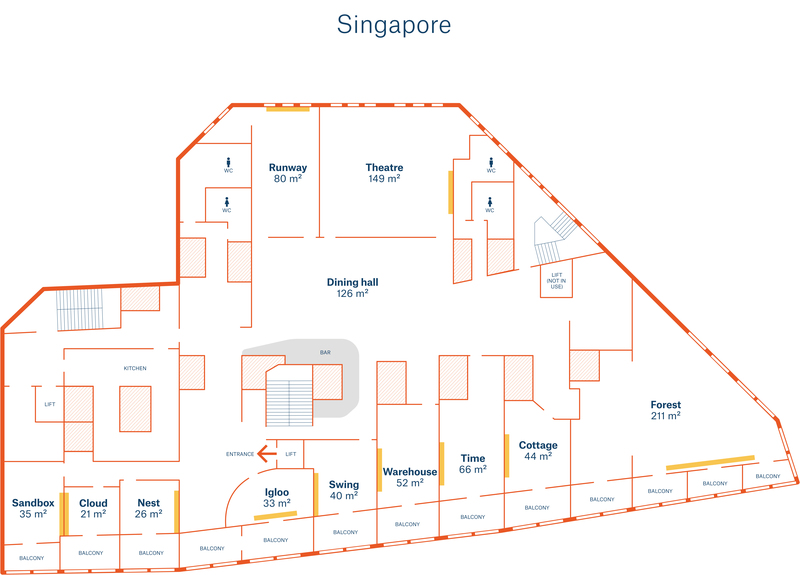 Its strategic location provides for guests to easily arrive by car, train (Clarke Quay or Fort Canning), bus and even by the River Boat. This makes HUONE Clarke Quay one of the most easily accessible meetings and event venue in Singapore. This venue makes meetings and cooperation more productive, fun and creative. Also great food and 5 star service! Our address is 3D River Valley Road, #03-01 Clarke Quay, Singapore 179023. HUONE customer parking is located in the Clarke Quay Multistory Carpark at 3D River Valley Road, #03-01 Clarke Quay. Walk along the Singapore River. Turn right into Peddlers Walk, the entrance to HUONE will be on the left. Our entrance with stairs and elevator is inside Peddlers Walk. You’ll find our name and hexagon logo to direct you there. HUONE Singapore is located in D block of Clarke Quay on the 3rd floor, facing the beautiful Singapore River. We are directly above the famous HaiDiLao HotPot Restaurant. Our entrance with stairs and elevator is inside Peddlers Walk. You’ll find our name and hexagon logo to direct you there. Walk through Clarke Quay until you reach the center fountain. Turn 45 degrees left to walk down Peddlers Walk. Our entrance with stairs and elevator is inside Peddlers Walk. You’ll find our name and hexagon logo to direct you there. Take Exit 2 onto Havelock Road. Use the Left Lane to merge onto Havelock Road. Turn left onto Eu Tong Sen Street. Turn left onto River Valley Road. Turn left into Canning Lane to get to the Clarke Quay Multistory Carpark. Take Exit 2 to merge onto Clemenceau Ave. Turn right onto River Valley Road. Do a U-turn at the end of the road and keep left. Turn left into Canning Lane to get to the Clarke Quay Multistory Car Park. Walk along the Singapore River. Turn right into Peddlers Walk. Our entrance with stairs and elevator is inside Peddlers Walk. You’ll find our name and hexagon logo to direct you there. Board Bus 32 or 195 from City Hall MRT [04168, Aft City Hall Stn Exit B] to Clarke Quay Station (2 stops). OR Board Bus 54 from Newton MRT Station [40189, Newton Stn Exit B] to Clarke Quay Station (11 stops). Take Exit G and take the escalator up to the ground floor. Make a left turn towards the Central Concourse. Turn left and exit the Central Concourse. Cross the Read Bridge and turn right at the end of the bridge. Walk along Block D until you see Peddlers Walk on your left. Our entrance with stairs and elevator is inside Peddlers Walk. You’ll find our name and hexagon logo to direct you there. Take Exit A and take the escalator up to the ground floor. Make a right turn upon exiting the MRT station and cross the road over to Liang Court via the traffic light. Continue walking straight towards the taxi stand at Clarke Quay. Turn right from the taxi stand and walk straight towards the fountain in Clarke Quay. Turn 45 degrees left and walk down Peddler’s Walk. Our entrance with stairs and elevator is inside Peddlers Walk. You’ll find our name and hexagon logo to direct you there.